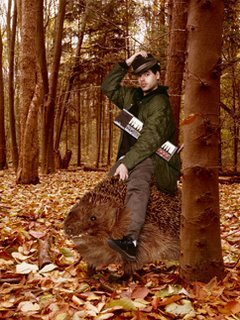 The keyboard wealding guy riding in his porcupine is Mocky. Currently residing in Berlin, this Canadian born singer is getting ready to release his new album Navy Brown Blues. When Mocky is not doing his thing he takes part of hilarious puppet rap group the Puppetmastaz. Besides that he is also a good friend of other Canadian ex-pat's Peaches, Jamie Lidell and Feist! One cool guy eh? First song is the official single heralding the new album - Fightin' away the tears. A wonderful tune sounding like what you expect from a Mocky album with added vocals from Feist. I really like the very leaned back attitude of this song - actually this would probably make good café music. It sound like what Nora Jones would sound like if she was any good, plus its funny. Finally note the ooouuh ohh ouuh of Mocky, that a man who knows what it takes to be cool. Second song is like the first song from the new album. Actually I like this song more than the single, but that only means that the album is going to be really good. What is there to say... Good dance tune, good vocals, a bouncy beat and good rhymes. This is what it feels like to actually have to climb a mountain of whipped cream wearing protection pads - it's that smooth! sleeping bag. You wouldn't want anything within your bag poking you in the back, why would you think your dog would. When our level of motivation is low we are a like a car without fuel. as a hobby, and had no idea that it would develop into a new financially gainful career. so it can be ten pounds worth or fifty pounds worth depending on what one wishes to spend. reach into the very expensive range depending on the embellishments or the prestige of a specific brand.